Last weekend I had the pleasure of delivering a presentation on change and technology to a group of tyre dealers, on behalf of local Cooper Tires distributor Exclusive Tyres (yes, I never realised there was two different spellings either). As the presentation took place in the week of Back to the Future Day (when Marty and Doc travelled to 21 October 2015) , it seemed fitting to use the film as a starting point for the presentation, to point out the dangers of trying to predict the future. 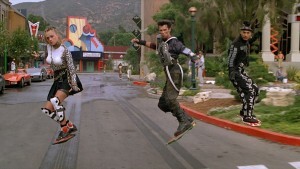 One of the most memorable predictions that the film made was that skateboards would hover. The idea of a hoverboard captured popular imagination, and even led local hiphop artist Seth Sentry to ask ‘where’s my hoverboard?’ in his song ‘Dear Science‘. He definitely wasn’t alone in asking that question – most of the people in the audience conceded they’d buy one if they were on the market. But great innovations like hover technology can have unintended consequences. If you can make a skateboard hover, then why not a car? And what don’t hoverboards have that skateboards have? Wheels. So if you can make a hoverboard without wheels, it stands to reason that you can make a hovercar without wheels. That’s not so good for anyone who sells tyres for a living. Its anyone’s guess as to when we will see commercial hoverboards, but this Canadian inventor is one of many working hard to bring that dream to reality. It is a vision that perhaps should give tyre sellers cause to pause and think about their future.